I recently picked up a copy of The French Laundry Cookbook, a magnificent tease into the magical world of Thomas Keller’s gastronomic temple. 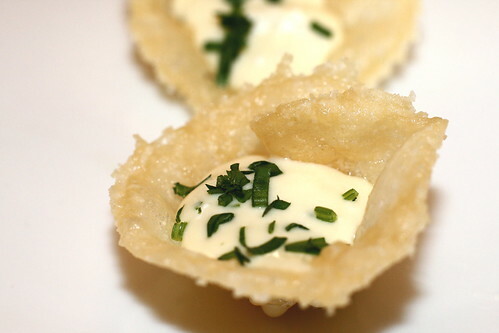 Hungry, but not quite looking for a meal, I decided to give the parmesan crisps with goat cheese mousse recipe a try. I believe these bite-size snacks are served at the restaurant’s courtyard while patrons sip on champagne and enjoy the beautiful Napa countryside. The process was surprisingly straight forward: Finely grate a cup of parmesan reggiano, and on a silpat, use your fingers to evenly spread the cheese into circles approximately two and a half inches in diameter. Bake the cheese for around 8 minutes until they reach a nice golden brown. Getting the crisps to conform into the right shape is the trickiest part. 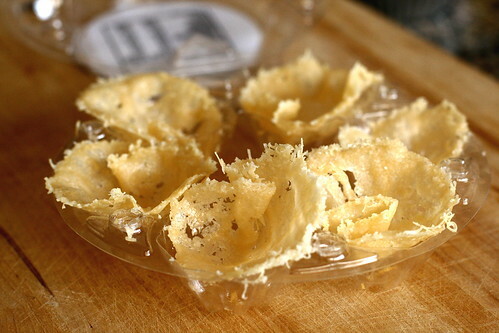 To do this, while the crisps are still warm, gently mold them into an empty egg carton and leave to cool. The goat cheese mousse is simply a blend of goat cheese, heavy cream, parsley and chives to garnish. Throw it all in a blender, and refrigerate. The results were nice, though the hot and humid weather caused the goat cheese mousse to melt very quickly. Next time, I intend on adding a little honey to the mousse to balance the saltiness of the parmesan crisps. Alternatively, pair with a sweet wine for a killer combination that will surely build an appetite! Looks nice! I want to try it. These look delicious. Cheese on cheese . . . how lovely! I wonder, can you serve these with ale? Or too much conflict with the goat cheese? Beautiful pics . . . thanks for sharing! 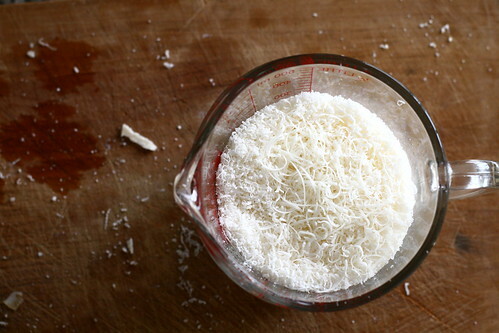 at what temp do you bake the parmesan reggiano? looks delicious! These look incredible what a great appetizer for the peoples!! Love the tip of adding a smidge of honey..